Prof. Wilhelm Huck and coworkers publish on the catalytic transport of molecular cargo using diffusive binding along a polymer track in Nature Chemistry. 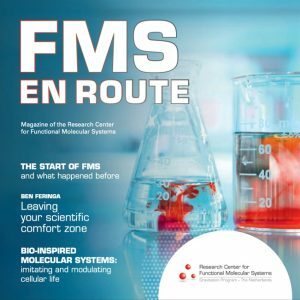 While lowering the mobility of molecules would intuitively lead to lower reaction rates, they show here that binding reactive molecules to polymeric tracks increases reaction rates by orders of magnitude. 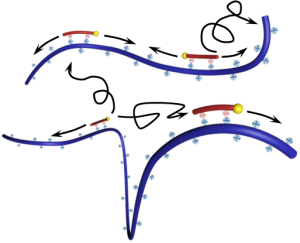 The effect can be explained by careful analysis of the mobility of the molecules, which show a combination of (slow) 1D diffusion along the tracks, coupled with frequent 3D hopping to other tracks or other segments of the same track (see figure below). As all other reactants are also bound to these tracks, they will actually encounter each other more frequently, thus increasing the reaction rate. This system is very reminiscent of how DNA-binding proteins involved in gene expression can find their target sites remarkably quickly, despite the enormous length of DNA molecules. They expanded this system to include molecules that can pick up molecular cargo on one polymer track and deliver and deposit their cargo on another, even if the target is physically separated by a gel layer. This approach opens up new routes for the development of non-traditional catalysis, not based on lowered the transition state, but based on increasing the frequency of molecular encounters.